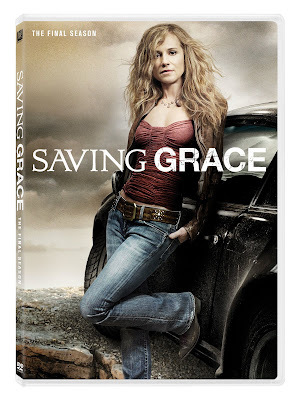 Home » Home Entertainment » DVD Info: Final Season of SAVING GRACE coming to DVD in July. Home Entertainment Release Recap for July 13, 2010. DVD Info: Final Season of SAVING GRACE coming to DVD in July. Fox Home Entertainment has announced they will be releasing SAVING GRACE: The Final Season on July 29th. It will have a MSRP of $49.98. A top-notch forceful investigator whose wild personal life translates into a no-holds barred approach to her work, the fiery Oklahoma City police detective is back to tackle her biggest investigation yet… her own emotional crisis. With the guidance of an unconventional “last chance” angel, the cynical and fast-living Grace works to save herself from her wild ways and finally find peace and redemption.